The 1996 Summer Olympics stole my heart. I arose early every morning to watch the less-popular events (decathalon, archery, canoeing) and stayed glued to the television for hours, only leaving my station for emergencies of the bathroom or hunger variety. 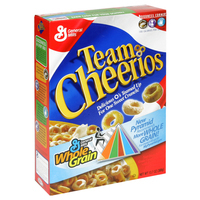 To satisfy my hunger, there was only one choice: Team Cheerios. I ate them by the fistful, digging into the sack of sugar-coated oats in search of the “medal” hidden within. By the end of the games, I had seven medals — the full collector’s series. The pursuit entailed a close call with diabetes, but every champion must make sacrifices. Speaking of champions, there was one who greatly eclipsed me in terms of sacrifice: Kerri Strug. If the ’96 games had a franchise player, it would be Strug and her unforgettable feathered pixie hairdo final vault. On the track, none could compete with Michael Johnson, the fastest man in the world. 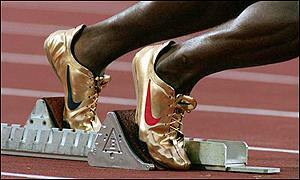 Johnson bolted to gold in the 200 and 400, setting a world record in the most fashionable gold sneakers a Jill had ever seen. When the games wrapped up, I felt deflated. Not only had I lost my connection to heros, but I also realized that I would never take that stage. I simply wasn’t engineered to touch my toes or cover 200 meters in fewer than 20 seconds. So, I did the next best thing: I got a feathered pixie hairdo and a pair of gold sneakers. And I wore them to school every day — with seven plastic medals around my neck. I have to see a picture of a much younger Jill rockin’ a short feather-do and some gold sneakers, lol..
What a great story. This ranks up there with you hiding your clothes in the snowbank.